A wrap dress is the season’s easiest and most versatile go-to dress and it’s the one style that flatters every figure. Literally anything goes with these fun and flirty dresses: feminine heels, wedges, statement jewelry or the simple layering of delicate jewelry. Pictured, I play up the beautiful purple pastel color with other purple accessories and I threw my hair up in a pony in order to show off the collar. Diane Von Furstenberg is the queen of designing the wrap dress and that is who made the dress I’m wearing. (Also, it’s a DVF wrap dress that Princess Kate Middleton wore a few weeks ago that sold out literally in minutes!) I purchased my dress at a Neiman’s Last Call last year so the exact one is no longer online in purple unless you search eBay for “DVF Robin Wrap Dress” then it comes up in various sizes. 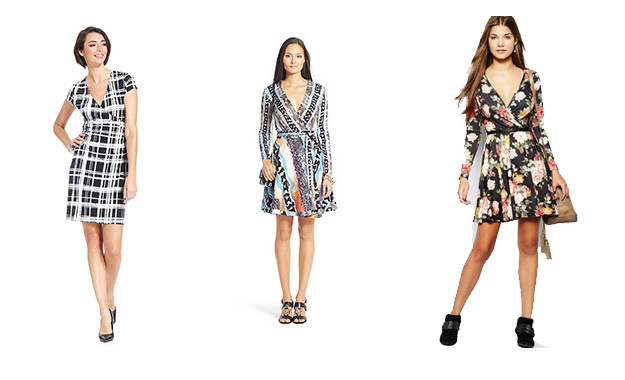 Below are also some of my favorite wrap dresses for the season!